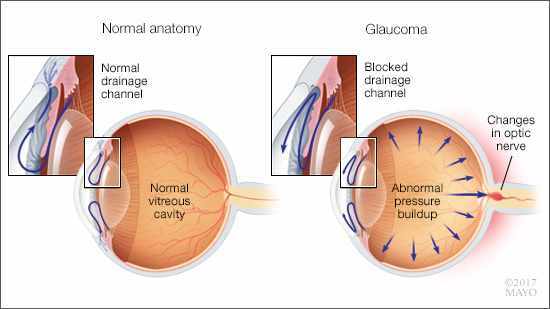 Mayo Clinic Q and A: Glaucoma — are you at risk? DEAR MAYO CLINIC: I’m 45 years old, and I just started wearing glasses a few years ago. I usually go to my eye doctor once a year for a checkup. During those exams, in addition to checking my vision, my doctor looks for signs of glaucoma. What is glaucoma? Who’s most likely to get it? ANSWER: Glaucoma, which is a group of serious eye disorders that damage the optic nerve, is the leading cause of preventable blindness in the developed world. Because it rarely causes symptoms in its early stages, regular eye exams that include checking for glaucoma are important. A variety of factors can raise your risk for glaucoma, including age and having a family history of the disease. Your optic nerve is a bundle of nerve fibers that goes from the back of your eyeball to your brain. It serves as the communication cable between the two, allowing you to see. In most cases of glaucoma, the optic nerve is damaged by a rise in pressure within the eye. The elevated pressure usually is due to a blockage of the eye’s drainage channels, preventing fluid that is constantly produced in the eye to flow out of it. As the nerve deteriorates, blind spots develop in your vision. If left untreated, glaucoma leads to blindness. In its early stages, glaucoma usually doesn’t have any symptoms. Typically, it is not until the late stages of the disease — after significant damage already has been done — that people who have glaucoma begin to notice eye problems, such as loss of peripheral vision. That’s why it’s crucial to get regular eye exams that include looking at the appearance of the optic nerve through a microscope, as well as a measure of the pressure within your eye. If your doctor suspects glaucoma, he or she may recommend other tests, too. In general, a comprehensive eye exam is recommended once every two to four years for people 40 to 54 and every one to three years for those 55 to 64 ─ even if you have no problems with your eyes or vision. After 65, you should have a comprehensive eye exam every one to two years. Depending on your risk factors, these exams may need to be more or less frequent. Two of the most significant risk factors for glaucoma are age and family history. People older than 60 develop glaucoma much more frequently than younger individuals. And the disease tends to run in families. If you have a close relative who’s been diagnosed with glaucoma, make sure your eye doctor is aware of that. Other risk factors for glaucoma may include having high or low blood pressure, as well as other medical conditions such as diabetes, heart disease and hypothyroidism. However, in most people, glaucoma is not associated with other diseases. A severe eye injury can put you at risk for glaucoma, as can certain types of eye surgery and being nearsighted or farsighted. Ethnic background also appears to impact a person’s risk of developing glaucoma. African-Americans who are older than 40 have a much higher risk for developing glaucoma than Caucasians. African-Americans also are more likely to suffer permanent blindness as a result of glaucoma. People of Asian descent also have an increased risk of developing certain types of glaucoma.